A fear of flying can be an enormous disadvantage to many people, making them miss out of family reunions, business trips and holidays. 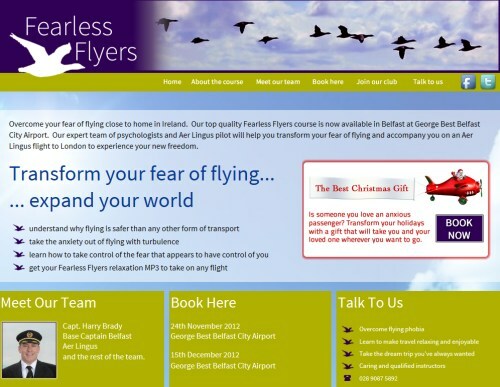 Fearless Flyers offer courses to those with this phobia to help them understand why flying is the safest form of transport. The courses run with the backing of Aer Lingus include a team of psychologists as well as an Aer Lingus Pilot. We’ve built an eyecatching brand and website for fearless flyers to promote the business online as well as offer the opportunity for customers to sign up for the course online.